Flying with kids is great because you get to view the world through their eyes. They get excited about things you’ve taken for granted, and they give you a fresh outlook on the world. But flying with kids can be stressful and challenging, and it does require a little more planning. 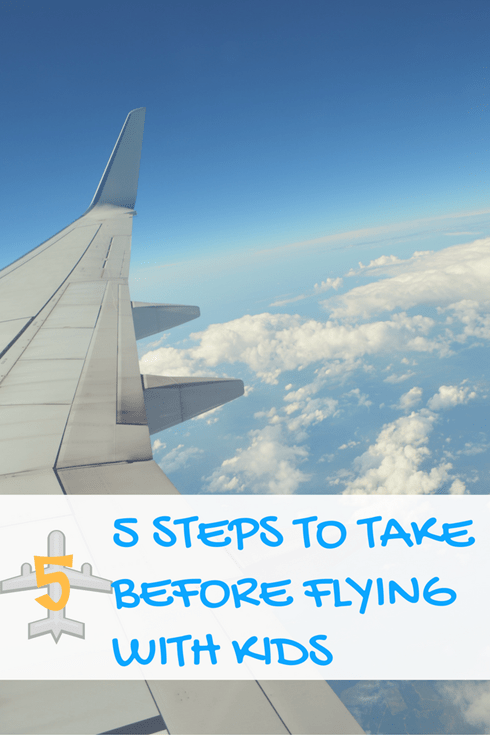 Here are 5 steps to take before flying with kids that will help you be more prepared and better able to enjoy the ride. Be sure to check the website every Tuesday when I share a new travel tip. Have a question about flying or family travel? I’d love to help! Ask in the comments below or on my social media pages (Facebook, Instagram, Twitter). Many people think that since they booked tickets together, they will get seats together. This does not automatically happen. When you book your tickets, be sure to select seats. If there are not seats available together, follow these steps to get seated together for your flight. If your family is booked on separate reservations (maybe one is using miles and the others paying), you can call reservations to have them link your reservations. This way the agents at the airport will know that you’re traveling together. This little app helps so much in planning and sharing lists. Instead of hand-writing all the to-lists, emergency information, and caregiver instructions, just enter the information in this app. You can share the lists with others and it’s easy to update as schedules or needs change. This app will save you time and will help ensure any caretakers helping you have the information they need to properly care for your children and pets. If you’re new to flying with kids, you’ll love this app. Easy to navigate, this app shares a pre-flight checklist, tips for in-flight, soothing music to help calm your sleeping child, and fun videos to help distract a restless child. Ideal for parents with babies who are new to flying. Read more about this app here. Check the app store to see if the airports you are flying in and out of have apps. These can be useful for mapping out play areas, the best food choices, and other useful amenities, like travel lounges (especially useful if you experience a lengthy delay) and nursing rooms. Ride share programs have taken off and many times it is easier with family to get a Lyft or Uber Ride. By downloading these apps in advance you will have them available when you need them. If your children are still using car seats and boosters, be sure to plan to bring them for the ride, as the drivers won’t usually have these available. To make car seats more transportable, try using Go-Go Babyz TravelMate to transform your car seat into a stroller. For booster seats, check out the mifold Grab-and-Go Car Booster Seat or the BubbleBum Inflatable Booster Seat. To learn more about the Lyft program and to get a sign-up credit of $50, check out this guest post, Memoirs of a Lyft Driver- Part One. As mentioned above, the Little Peanut on-the-Go app is a great place to create your packing list. I’m more of a pen-and-paper kind of girl when it comes to making lists, though. However you make your list, start it early so you can jot down ideas as they come into your head. Think about your destination and whether or not you will have the opportunity to buy supplies like diapers and kid-friendly food there. Consider ordering items to be shipped to your destination rather than packing them. Grocery store delivery services might even be an option. It’s a fine balance to pack essentials but not bring more than you need. But creating a list helps you determine what items are important for you to bring and what items you can get at your destination. If you have children in car seats, will you bring the car seat on the plane or check it? Will you need the car seat at your destination? For my family we have always traveled with the car seat since we need it to get to and from the airport both at home and at our destination. Once in a booster seat we have been able to sometimes leave it behind when family members picked us up from the airport with a spare booster seat. If you are bringing your car seat but not planning to use it on the airplane, there is no need to lug it through the airport to the plane! Airlines will check it for free as an “assistive device”. A travel bag is recommended for protection. I always forget to bring one and one time my car seat was soaked when it was returned to me on a rainy day! Check to be sure your car seat is FAA approved. There will be a sticker on the side of the car seat that says it’s approved, and you might need to show this to flight crew if it’s requested of you. Check with the airline to determine the aircraft seat dimensions then verify your car seat will fit in the seats. Plan a way to get the car seat to the plane. My preferred method is the GoGo Babyz TravelMate Wheels, but you could also use a luggage cart or a car seat backpack. Request early boarding in order to get the car seat installed. Know that per the FAA, car seats must be placed in the window seat, or not between a passenger and the aisle. Whether you’re staying in a hotel, renting an apartment, or staying with relatives at their house, you need to consider where your child will be sleeping. It’s not so much of an issue for older children: a sleeping bag on the ground would even suffice. But for babies and toddlers, who are more sensitive to their sleep environment, finding a safe and comfortable bed is important. When my oldest was a baby I used a pack ‘n’ play. It was a hassle to travel with and wasn’t very comfortable. She didn’t sleep well in the first place and getting her to sleep in the pack ‘n’ play was a huge struggle. For my second born I purchased the Baby Bjorn Travel Crib, and it was great! It sets up in less than a minute and is very comfortable. Since the mattress rests on the floor, there are no support bars poking into baby’s back like on the pack ‘n’ play. We used this travel crib until my son was 3.5! Even though he really was too big for it, he loved sleeping tucked against the side, so it didn’t bother him that he couldn’t stretch out. If you need an extra place to sleep for a toddler or preschooler, this AeroBed for Kids is my top choice. We used this from age 3-7 for my daughter. Having a consistent travel bed helped her sleep since she didn’t have to adapt to a new sleep setting each place we traveled. This mattress is comfortable enough for me to sleep in!